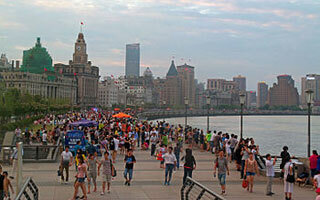 The Bund or Waitan is a waterfront area in central Shanghai. The Shanghai Bund has dozens of historical buildings, lining the Huangpu River, that once housed numerous banks and trading houses from the United Kingdom, France, the United States, Italy, Russia, Germany, Japan, the Netherlands, and Belgium, as well as the consulates of Russia and Britain, a newspaper, the Shanghai Club and the Masonic Club. The Bund lies north of the old, walled city of Shanghai. It was initially a British settlement; later the British and American settlements were combined in the International Settlement. Magnificent commercial buildings in the Beaux Arts style sprung up in the years around the turn of the 20th century as the Bund developed into a major financial center of east Asia. Directly to the south, and just northeast of the old walled city, the former French Bund (the quai de France, part of the Shanghai French Concession) was of comparable size to the Bund but functioned more as a working harbourside. This article uses material from the Wikipedia article "The Bund", which is released under the Creative Commons Attribution-Share-Alike 3.0 License.